Leading-edge technology in perfection : The seca model 674 with Smardcard station. 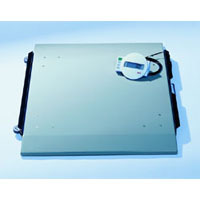 Its innovative technology enables the storing and activivation of different wheelchair weights. Physicians and nursing staff will be able to consign awkward subtraction of individual wheelchair weights to the past: just push the Smartcard into the display and at once only the patient's weight appears. The Smardcard can be kept on the wheelchair itself using the card holder. Using as many cards as you to take the different weights of account. The scope of supply includes three cards and three card holders. Of course this functionally extended model also incorporates all advantages and functions of the seca 674.